First a note to international readers. In the U.S. the first two weeks in April is many sports-minded people’s favorite time of the year because of a confluence of great events highlighted by the college basketball national tournaments and the tradition-rich Masters golf tournament. There’s also the start of the professional baseball season and the beginning of the professional hockey and basketball playoffs. And this year there’s going to be a pretty special footrace in Boston next Monday, the 21st. Few, if any, expected to see the Universities of Connecticut and Kentucky play for the national basketball championship. Combined, both teams lost nineteen games during the regular season. Similarly, Bubba Watson looked completely lost on Augusta National’s greens during Saturday’s third round. Most people thought it was Louisville’s, Arizona’s, or Florida’s tournament to lose and Matt Kuchar’s turn to break through in a major championship. Few were shocked when Bubba fell behind by two strokes early during Sunday’s final round. But Bubba, following Connecticut’s and Kentucky’s lead, rallied to play his best golf at the most important time, and won by three strokes. My takeaway is this. Next week in Boston, pay no attention to who is in the lead at the halfway mark. In fact, don’t place too much importance on who is ahead at the 20 mile mark. In keeping with this sports season, someone unexpected will assert their will on the field over the last few miles. Call me crazy, but maybe even someone not from East Africa. When I first sketched this post in my head, I was playing around with what, if anything, these athletic contests have to do with how you and I should live. But I was forcing it because athletic competition is not a meaningful metaphor for life. Because only one team hoists the national championship trophy and only one golfer puts on the green jacket each April. In life, the more our family members, close friends, and co-workers flourish, the better our lives. The key to that is cooperation in the form of mutual support. In contrast, family, friendship, and co-worker competition inevitably results in petty jealousies, anger, and dissension. 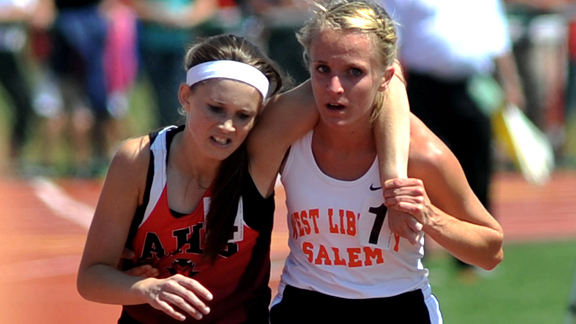 And yet, sometimes there are sublime moments of cooperation in the heat of athletic competition. For example, at one of last year’s major marathons, the two men leading the race passed one water bottle back and forth. Maybe they were Stoics even more focused on giving their best effort than finishing first. And often the most awe-inspiring moments are compliments of young athletes, like high schooler Megan Vogel, who flat out reject win at all costs thinking.